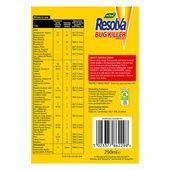 Resolva Bug Killer Ready To Use is fast acting and can be used to control a wide range of difficult pests on over 30 types of fruit, vegetables and flowers. It can be used either indoors, including greenhouses or outdoors and will keep working for up to 2 weeks. Resolva Bug Killer Ready To Use controls aphids (greenfly and blackfly), beetles, bugs (lygus), blossom weevils, capsids, caterpillars, cutworms, cabbage stem weevil, clay-coloured weevil, carrot fly, leaf-curling midges, leaf beetles (including rosemary beetle and lily beetle), pea midge, pea moth, pea and bean weevil, sawflies, scale insects, thrips and whitefly. Resolva Bug Killer Ready To Use also gives a reduction in the numbers of mealybugs. Not known to be hazardous to plants. No sensitive species or varieties are known. For best results treat when infestation or symptoms are first seen. For best results spray plants during late afternoon or early evening. Avoid spraying in direct sunlight or when plants are under stress e.g. from drought, frost, heat or over watering. Before treating exotic plants or large areas of the same plant species, undertake a test for damage on one plant and observe for effects over a 10-day period. Carrot Fly 1000ml per 10 sq.m. Not recommended for control of whitefly on cucumbers and courgettes. Pesticide resistance in glasshouse whitefly and some aphids is widespread. Where resistant pests are present this product is unlikely to give control. May cause tingling/numbness (paraesthesia) if exposed areas are contacted. The effect is transient and may last up to 24 hours. Collect spillage. UK only: Dispose of contents/container to a household waste recycling centre as hazardous waste except for empty containers which can be disposed of by recycling. Contact your local council for details. Direct spray away from ponds and other surface water bodies. Dangerous to bees. Do not use where bees are actively foraging. Risk to non-target insects and other arthropods. Do not contaminate water with the product or its container.